Highland Cleaners has once again been recognized for its outstanding commitment to philanthropy in the Louisville community. With cash and in-kind donations totaling nearly $150,000, Highland Cleaners ranked second among companies of their size for cash donations in 2012. 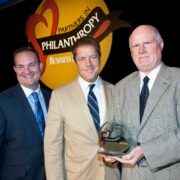 In recognition of this, we were awarded the “Corporate Giving Award” by Business First. When the bitter cold caused the pipes to burst at Central High School’s stadium, thousands of articles of clothing donated to the Clothing Assistance Program were drenched. Highland Cleaners volunteered its services to help make sure the clothes didn’t mold and mildew before they could be given to underprivileged children. Click HERE for the full Waver 3 News Story. TV series “Lost,” narrates a video about the Highland Green complex that’s shown at the Discovery Center. Check out the whole story on the Business First website CLICK TO VIEW. In an effort to give even the world’s strictest tree huggers choices they can be comfortable with, Highland Cleaners is introducing two new levels of Green Service to allow each customer to choose the level of “green” they desire.